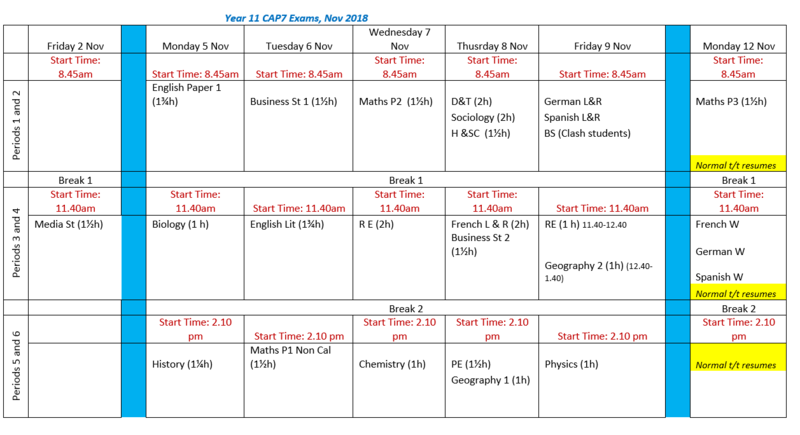 Year 11 students will have their CAP 7 exams week beginning 5th November. As is clear from the exam timetable, every day of the week 5th – 9th November has a significant number of exams, which makes the teaching of normal lessons counter productive. Therefore, year 11 students will only need to attend school when they have an examination. Revision facilities will be made available during periods 3 & 4 every day, therefore allowing students who have exams at the beginning and the end of the day only, the option not to go home. However, we are not able to make the revision facilities available periods 1,2 or 5. At these times, if students do not have an exam they should be revising at home. Normal timetable will resume from period 3 on Monday 12th November, for all students other than those taking French, German or Spanish. For these, normal lessons will start from period 5 on Monday 12th November. Please refer to the exam timetable attached for the context for this.